Unless you’ve been living under a (Casterly) rock, you’ll know that epic fantasy drama Game of Thrones returns to TV screens for its 8th and final season. With queen Daenerys Targaryen and her dragons central to the defence of Westeros, it gives us a great opportunity to look at the best dragon-themed slots. Dragon Born is a 6 reel slot from Big Time Gaming and is played using the MegaWays game engine where the number of ways to win can reach a massive 117,649. Look out for the harlequin that can turn whole reels wild as well as awarding multipliers of up to 7x. Multipliers can combine too to delivers boosts of up to 49x. Trigger the Free Spins feature and you’ll get between up to 50 free spins on the full expanded reels – you can also win more free spins. Super volatile action is what you’ll find in Dragon Maiden, a 5 reel, 243 ways to win slot from Play ’N Go. Look out for the Dragon Maiden who can transform multiple symbols into wilds whenever she hits. Trigger the Free Spins feature and you’ll receive up to 12 free spins. Each scatter that lands during the free spins expands the reels. At their maximum they can offer 7,776 ways to win. There’s also a Golden Free Spins feature which takes place on a fully expanded reel set. There are wins of 5,000 times your stake on each free/golden free spin. Eye of the Dragon is a 5 reel, 10 payline game that ticks all the right boxes for a Novomatic slot. Combining rather basic design, simple gameplay and a potentially explosive Free Games feature that awards 10 free spins with expanding symbols, Eye of the Dragon offers straightforward volatile action. Dragon Kingdom is a 5 reel, 25 payline slot from Pragmatic Play that comes with just a single extra, the Free Spins feature – it has the potential to be a cracker. Once triggered, you get to choose from a collection of stacked symbol and multiplier combinations. These offer boosts of between 1x and 5x. Simple and well designed, this is a classy take on the dragon theme. A band of mediaeval warriors go on a quest for treasure in Dragon Champions, a volatile, 5 reel, 4,096 ways to win slot from Playtech. Central to the action here are the special Dragonfire symbols that can expand in 4 directions. Trigger the Dragon Champions Free Games feature and you can win up to unlimited free spins. It’s not the flashiest looking game you’ll play but the gameplay stands up pretty well. Yggdrasil Gaming usually comes up trumps when it comes the design of their slots and Double Dragons is a case in point. It’s a 5 reel, 20 payline game that comes with dropdown wins with respins and multipliers. Also boosting your winning chances here are stacked wilds and free spins. If you like plenty of design flair from your slots, then this is the one to choose. Kingdom of Legend is our second pick from Novomatic and features no dragons – the characters/theme will remind you of Game of Thrones though. Brilliantly designed, the features aren’t bad either. Look out for the Orc Bonus feature who can award cash prizes of up to 500 times your stake or a spin of the Bonus Wheel feature. This awards more cash prizes, free spins or a spin of the Super Wheel where even bigger awards are up for grabs. Look out for the lightning wilds that can strike at random on any free spin too. Well designed (yes, it’s a Novomatic slot!) and delivering plenty of action, it’s my favourite Novomatic game. Dragon’s Fire is powered by Red Tiger Gaming and comes with 5 reels and 20 paylines. With a dragon and a dragon egg either side of the reels, each win triggers the Dragon’s Egg Multiplier feature where the multiplier increases by 1 up to 50x! The Dragon’s Eye Boost feature can also come into play to increase the multiplier by 10x. The Fire Blasts feature where reels can be turned fully wild – you can also play the Free Spins feature where you get free spins and a multiplier that can only increase. High variance, there’s 10,000 times your stake to be won from each spin or free spin. 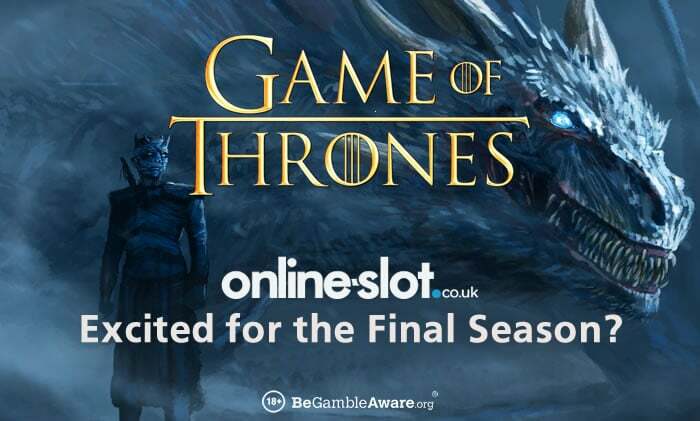 The obvious place to finish is of course the slot based on the hit TV show – Game of Thrones. It’s a 5 reel game where you can choose to play in 15 payline or 243 ways to win modes. The highlight is the Free Spins feature where you’ll have the pick of 4 extras, each one based on 1 of the warring Game of Thrones families. They each come with a different combination of free spins, multipliers and stacked symbols. If you’re looking for a slot to get you in the mood for the new series, then this should do the job nicely – despite it not offering any dragons!